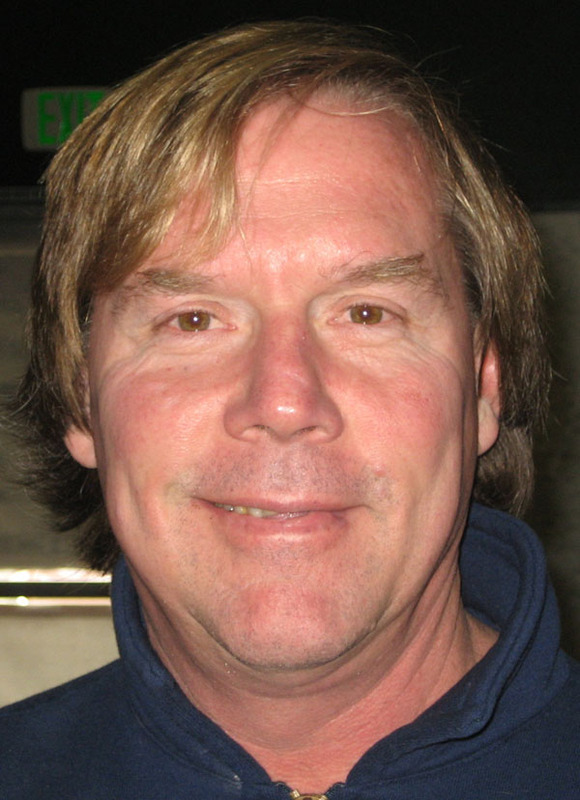 Bio: Joe began his career in Monterey Bay, CA, where he worked as a professional for the Pebble Beach Company. He started out as an assistant at Pebble Beach before moving to Del Monte, then Spyglass Hill. He returned to Del Monte as head pro in 1992. Two years later, after having vacationed in the area several times and falling for the place, Joe brought his family to Bellingham. In his 16 years here, he has worked as the head pro at Shuksan and Sudden Valley and as the Director of Instruction at Lake Padden. 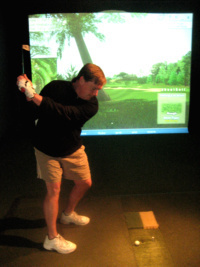 He set up Joe’s Professional Golf Lab and Indoor Golf Center in 2006. As Bubba Watson was strolling down the 10th fairway in his playoff with Louis Oosthuizen Sunday, the cameras found the left-hander's drive in the shrubbery and, in one voice heard around the world (sorta), tens of millions of armchair patrons mumbled "No chance." Even though we had watched him hook and slice his way to a typically dramatic 72-hole total of ten-under 278, and even though we all knew how capable he is of hitting extravagantly-curved shots, none of us quite believed he had the neccesary dexterity to pull off something special from this position. Even as his addressed his ball, it wasn't clear what Watson was planning to do. Going for the green was out of the question obviously, but he didn't seem to be setting up for a simple chip shot back to the safety of the fairway either. But as he reached the top of a full swing, then rolled his hands aggressively through impact and finished with the clubface looking down at the ground almost, it became apparent that crazy, mop-haired Bubba was indeed going for the green. And not only did his ball finish on the putting surface, it rolled to within eight feet of the hole. It's one thing to hit a shot out of the trees to win the Masters. It is quite another to hook a wedge 50 yards out of the trees to win the Masters. Joe Holdridge says hooking a wedge as much as that is probably a little easier than slicing it that far, but is still an incredibly difficult shot. Here he tells you how to go about it. When you ask a pro golfer how they draw or fade the ball, most will tell you they don't follow hard and fast rules, they simply 'feel' the shot. 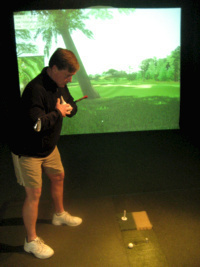 To hit a gentle, five-yard, draw for instance, they will have the feeling of releasing their hands a little more through impact or, when hitting a fade, delaying the release or holding the club off. Bubba's shot was not a gentle draw, however, but a profound hook. 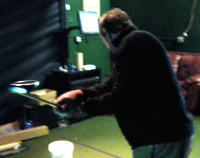 To curve the ball this much he needed to stand very closed to his target line and hood the face of the club. In the picture on the left, the flag on the simulator screen is behind the tree but, as you can see, I'm aiming my body - shoulders, hips, knees, toes - well to the right (I'm right-handed while Bubba is a lefty so it looks different, but the principle is exactly the same of course). To encourage a very quick, exagerrated, release of the clubhead through the ball, I would also make my grip stronger which, as the second image on the left shows, means I can see most of the top of my left hand and the palm of my right faces the sky almost. 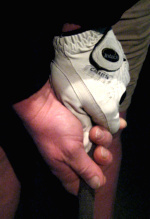 It's also crucial that you grip the club lightly. Otherwise, you will restrict the release of the clubhead and severely reduce the amount of hookspin you can put on the ball. I'd also play the ball well back in my stance (see left) which promotes a clubhead path that approaches impact from inside the target line. 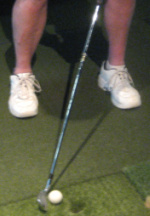 To hit a draw or, in this case a wild hook, your club must come into the ball from the inside. If it comes from the outside your ball will most likely start way left of the target. And if the face is hooded, the ball will go even farther left. Unless you're playing the 1st or 18th at St Andrews, you will probably be in a whole lot of trouble. As for the swing itself, you should have the feeling it is 'rounded' with the clubhead moving behind your body in the backswing (as demonstrated in the image on the left). Don't overdo it though or your weight will shift back onto your heels which will make you want to push forward in the downswing. And that leads to the horrible over-the-top move. Just focus on maintaining the flex in your right knee, and keeping the weight on the balls of your feet. Now comes the really important part - the release. A good release is the squaring of the clubface and it happens as a result of a good swingpath and the always-increasing momentum of the clubhead during the downswing. Ideally, it occurs naturally, but to hit Bubba's shot you need to manipulate the release by totally overdoing it. The right forearm touches the left shortly after impact (see left) and the clubhead is so closed it virtually faces the ground. Normally I wouldn't recommend that amateurs attempt Bubba's shot. They really should just chip out sideways and avoid total disaster. But if there's something important on the line, and you have to find the green, why not give it a whirl?